So, the new Metro timetables are out, and those of us with geeky tendencies have been poring over them. Altona Loop trains originate at Laverton, meaning a lot more space, more likelihood of getting a seat. Altona Loop and Williamstown trains drop from every 20 minutes in peak to every 22 minutes. To be useable, timetables need to be either frequent or memorable. This is neither, and it calls into question why something wasn’t done during the $90+ million Laverton Turnback project to ensure 20 minute services could continue to run. Werribee trains more frequent and regular in peak, about every 11 minutes, and all bypass Altona Loop. Altona Loop passengers have to change at Newport outside peak hours. And again at North Melbourne or Southern Cross if they want a Loop station. It might be the first time that (Stony Point line excepted) passengers have had to change trains twice to reach some City Loop stations. Williamstown passengers will no longer have to change at Newport outside peak hours — the flip side of the Altona change. Stations between South Kensington and Newport get more consistent services, every 10 minutes interpeak and every 11 minutes during peak. Werribee and Williamstown trains upgraded to every 20 minutes on weekday evenings until about 10pm (then every half-hour). …but they won’t run through the loop, so some people may have to wait up to 30 minutes at North Melbourne. Belgrave/Lilydale line more AM weekday services after peak, including lots of expresses for people beyond Box Hill. 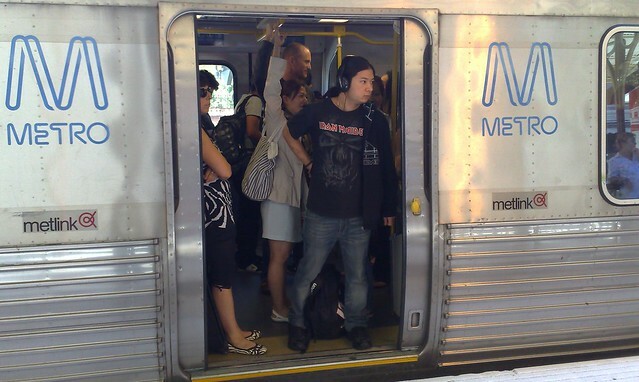 Glen Waverley direct to Flinders Street on weekday mornings, and more frequent in peak hour. Cross-platform interchange at Richmond. Alamein/Blackburn trains will run via the Loop instead. This should cut delays to Burnley group lines (as well as the Dandenong line), as it reduces conflicting movements. In the afternoon, Glen Waverleys run via the Loop, whereas Alamein/Blackburn trains run direct from Flinders Street. It’s probably fairer, but is it also more confusing? Note 7/5/2011: When I wrote this post I didn’t notice the reduction in trains stopping at Laburnum, Camberwell and Glenferrie. Dandenong gets trains every twenty minutes on weekday evenings until about 10pm. Longer trips on the Frankston line, which will have a concentration of Siemens trains (the ones with brake problems and speed limits) to try and get some predictability in the timetables (and improve the punctuality stats). For instance — old timetable 7:21 from Frankston arrives Flinders St 8:34 (73 minutes stopping all stations) — new: 7:20am from Frankston arrives Flinders St 8:36am (76 minutes stopping all stations). I wonder if this’ll work? Frankston peak expresses extended for longer periods, into the shoulder peak period. Frankston shoulder-peak services don’t conform to the peak pattern. Very inconsistent and confusing, particularly with regard to loop operation in the PM. So much for the talk of more consistent stopping patterns. Frankston interpeak services now a regular ten minutes, all direct to/from Flinders Street, and through-routed to Newport (eg Werribee/Williamstown). Less confusing than the current half-Loop/half-direct pattern, and provides a cross-city connection. Sandringham gets more peak hour services (to about every 7-8 minutes), including one or two originating at Middle Brighton (actually coming straight out of sidings at Brighton Beach, I assume). Some other lines have a few extra services, or other minor changes, or no change at all. The Clifton Hill group is likely to get a shake-up when the South Morang extension opens, probably next year. 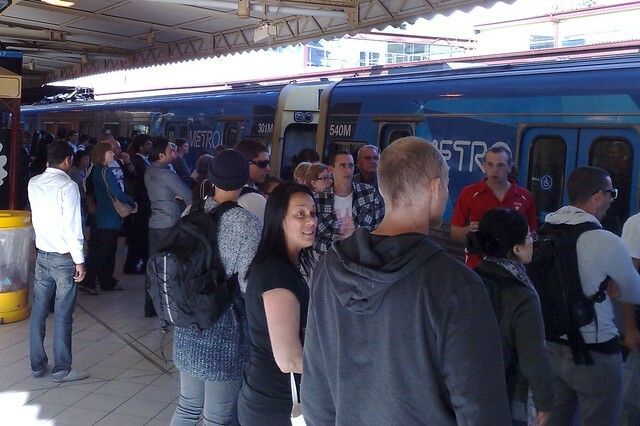 No weekend changes, despite increasing crowding, such as shown above — that’s the 5:08pm to Pakenham from Sunday afternoon. The Grand Prix was on, but all the fans were already at the track. Football at Etihad had finished, but there didn’t seem to be any fans around; they’d already gone home. The MCG football had just finished, but those fans were waiting for trains at Richmond. This was just a crowd of Melburnians heading home from usual (non-major-event) Central Melbourne activities. All services to run as six cars rather than three. In summary, some good, worthwhile upgrades that will in many cases will cut waiting times, and overcrowding and hopefully improve punctuality, but those at some stations will be left with a bitter taste (yeah the Altona people especially). Of course it’s just one step in the evolution of the system. Hopefully the next revision won’t be too far off, and will be a clearer step forward for everyone. Check out the new timetables here. PS. Myki 28+ day Pass users need to get their February compo claim in today (or possibly tomorrow; it’s unclear). It’s worth two daily fares. Metcard Monthly and longer users have a couple more weeks to claim. Claim forms here. Daniel, thanks as usual for the very comprehensive analysis. As a Brighton Beach station user, it’s a bugger that the two extra trains start at Middle Brighton. BB is a busy premium station, with huge car park, so all those commuters miss out. The trains will presumably travel empty from BB to MB station. Interesting changes; seems like quite a mixture. Closer to home: Upfield: Two new weekday services, yippy skip! Now there are THREE services to the city between 5am and 6am instead of two. Useful! Other than that, it stays at 19-22 minutes between services most of the time. Re 11/22min Werribee/Williamstown peak timetable. No line gets an even peak service or something that is easy to remember. The off peak is consistant 20 min, and the peak doesn’t last more then about 60-90 min, so clockface is meaningless anyway. I don’t see this as an issue. How do you have to wait up to 30 min at North Melbourne when the service frequency is 20 min, the most you will wait is 20 min. If you are talking about post 10pm then you should make that clear. Burnley Group – Mixing the stopping and express services through the same platform at Burnley (some stopping, some express) is going to be interesting. It is removing a conflict point with Glen Waverley, but creating a new one. Fix one problem, create another problem. I bet you will find trains stopped near the Yarra River waiting to merge each morning. New sidings at Brighton Beach (nothing to do with Sandringham accident, they were recommissioned before then, in fact the accident train at Sandringham train was shunting to go stable at Brighton Beach) is the result of the Middle Brighton trains. New siding at Upfield is the result of the extra trains on that line. Thanks Chris. Until a coupla years ago, there was a platform on the “sidings” side of the station, so passengers could board trains originating at Brighton Beach. Some dill decided to remove the platform, so now empty trains will travel to Middle Brighton. D’oh! Roger: Even if (when) the platform is reinstated, it doesn’t help the train in the siding getting passengers on. If the train is going to shunt from the siding to a platform (and not run direct to Middle Brighton) it might as well shunt to Sandringham. @Chris, yes, I was referring to after 10pm. @Roger, the platform at Brighton Beach is still there isn’t it – just fenced-off? @Paul, yes, they could run more services at least as far as Coburg if they wanted. Mind you, to be fair, they’re addressing the most crowded lines as a priority. Upfield (provided all trains run, and all with 6 cars) isn’t in that category. Interesting mix on my line (Belgrave/Lilydale). There will be 16 trains which skip Laburnum (all stop currently), and lots which skip Camberwell and Glenferrie (which mostly stop now). I can understand the reduction in Camberwell and Glenferrie stops, they now have the Alamein and Blackburn trains running into the loop, and it ballances the loading better. I am unsure why the Laburnum skip, I think it all has to do with running times so the merge clash at Burnley is avoided in the timetable. I have looked at the timetable for the Belgrave and Lilydale Lines and it is now very confusing for people who use the lines. First, because Blackburn trains has now extended to midday and stops at all stations except East Richmond, there is some major changes on where does it stop for trains to and from Belgrave and Lilydale. Services from 9:30am to midday has been altered to run express between Blackburn, Box Hill, Camberwell, Glenferrie and Richmond. However in the afternoons it still stops at all stations except East Richmond. Absolutely no changes on the Sydenham line? Seems ridiculous, I’m pretty sure they could work within the existing infrastructure to deliver a few more services during the peaks. And the “express” services which share a line with the stopping services don’t seem to make any sense; is there actually anywhere for the trains to pass? Simon: There are three types of expresses in Melbourne. 1). Real Expresses that run fast and overtake Stoppers, ie Belgrave/Lilydale, Frankston and Werribee Lines only. 2) Real Expresses that run fast, clog up the timetable taking the pathways of many stoppers. Things like the Hurstbridge line have theses. 3) Expresses that run slow, ie their running time is exactly the same as a stopper but they are scheduled not to pick up/set down passengers. These are on the Pakenham line, it is done purely to ballance the loading on trains, and by timetabling them slow (likewise for the V/Lines) then you can squeeze 18 trains an hour in, and no pathways are lost, everything available is used. East Richmond is another annoyance, but at least there are parallel tracks there. Daniel, yes, Platform 3 is still there at Brighton Beach, just fenced off. But that of course means that it’s inaccessible. @Jeremy, why is it confusing? It just continues (more-or-less) the peak pattern for another 3 hours in the morning. @Simon, they have said they will focus on the Sydenham line when the Sunbury line is electrified, as they’ll then have the chance to re-write it. Without checking the specifics, one reason for those expresses through West/Middle Footscray may be to keep the Metro train from getting in the way of a V/Line train behind it. I agree though, irritating when they crawl past. ‘(As one journo commented, it must take a special kind of person to work on these things for months on end. )’ I have often wondered about the role of computers in working out timetables. I assumed the basic rules are entered and a programme worked things out. But recent timetable changes for trains and trams seem to have a lot of human input. @Daniel I know that it has been extended until the lunchtime reversal, but unless a person does have the timetable, it’s a very hard to take note as in the morning, Belgrave/Lilydale trains runs express. However in the afternoons (only up to about 3pm) and evenings the Belgrave/Lilydale trains it stops at all stations except East Richmond. It can make people very difficult to remember. Also, the trains should only stop at specific stations during peak hour like the Pakenham Line so it can be easier to remember, as currently there are many stopping conditions for the Belgrave and Lilydale Lines during peak hour (examples are express Richmond-Glenferrie-Camberwell-Box Hill, or skip all stations between Richmond and Box Hill. @Chris – you forgot 4) Expresses that seem to make no sense, like the Glen Waverly expresses that have to slow right down to go over the tram squares at Kooyong and Gardiner anyway… at least there’s only three of them all up… which begs the question, why bother at all? What’s with ‘pretending’ that evening Frankston trains start at Southern Cross? Only if you don’t mind spending up to 15 mins sitting at Flinders Street! As a Frankston line passenger who often uses Friday evening trains, I’m annoyed that no trains go through the loop after 7pm. I suppose this is no different to the Sandy line, but there is a lot of inconsistency between 7pm and 8:30pm, meaning from a 4 to 18 min wait at Richmond. Luckily after 8:30pm it drops back to a regular 4-6mins (hopefully long enough to change platforms and compensate for late running trains). Solution: Leave city before 7pm, or have another drink or two and leave after 8:30pm! @Liz, you should find some of the waits at Flinders St are reduced with the new timetable. The 4-18 minute wait you looked at… did that include Belgrave/Lilydale/Glen Waverley trains? Having those as an option increases the number of trains from the Loop to Richmond markedly. 1. The Altona/Williamstown/Werribee cutback from 10min to 11min cycles in peak has nothing to do with the Laverton turnback, but rather the possible doubling of Geelong services that is expected. That means there isn’t enough room in the timetable to run everything in a 10-minute cycle between North Melbourne and Altona Junction. 2. People on the Cross-City Group wanting the City Loop in evenings can go to Flinders Street or Southern Cross and catch a tram. 3. Burnley’s reversal of direct and Loop trains in the AM/PM is a result of the track layout at Burnley Junction; it requires either a new crossover from Platform 3, Burnley to Platform 3, Hawthorn, allowing Glen Waverley to run direct and Camberwell to run via the Loop, or a flyover at Burnley allowing Glen Waverley and Ringwood to run via the Loop, and Alamein and Blackburn to always run direct.